Suppose that you live in a town that sprawls across the banks of a branching river, with an island in the middle. Seven bridges link the different parts of town. One sunny summer day, you decide to take a bike ride. Looking at a map, you try to find a route that would take you across all the bridges and back to where you started. You also add the challenge never to cross the same bridge more than once. If you succeed, you decide, an ice cream reward awaits you on your return. Is it possible to find such a route? Try it. This illustration shows the seven bridges (green) of 18th-century Königsberg. In essence, the bridges connect four separate pieces of land. Anyone standing on any given land mass would have to have a way to get on and, if they wanted not to cross the same bridge twice, a different way off. That means each land mass would require an even number of bridges. However, in Königsberg, each land mass has an odd number of bridges. As a result, all seven bridges can't be crossed without crossing one of them more than once. Leonhard Euler was an amazing person. Some people describe him as the greatest mathematician of all time. He was born in Basel, Switzerland, on April 15, 1707 (so this year was the 300th anniversary of his birth). As a young boy, he found it very easy to learn languages. He had an extraordinary memory and could do all sorts of mental arithmetic with astonishing speed. He entered the University of Basel at the age of 14 and obtained his degree three years later. Interestingly, if you were to visit Kaliningrad today, you would find that two of the bridges no longer exist, and a single bridge has replaced a pair of the bridges that crossed from one side of the river to the other via the island. A set of stairs in the middle of the bridge allows you to visit or leave the island. 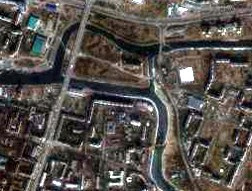 This satellite image shows Kaliningrad today, with its new arrangement of bridges. It's now possible, if you start on the island, to follow a route that crosses all the bridges without crossing any one of them twice. With this restructuring, the city planners may have thought they were foiling Euler's toiling. But of course, being a mathematician, Euler didn't just solve a single problemhe solved the problem generally. That is, he worked out rules for figuring out whether such routes exist for any number of land masses and bridges. 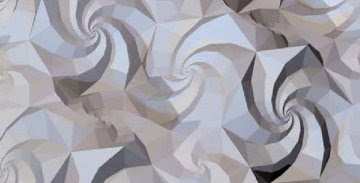 Playing with triangles can lead to amazing patterns and three-dimensional structures. 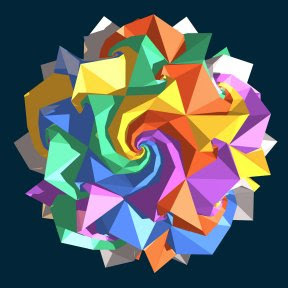 That's what Hungarian designer Dániel Erdély (below) found when he created an intriguing geometric form out of two spirals of triangles that get smaller and smaller. 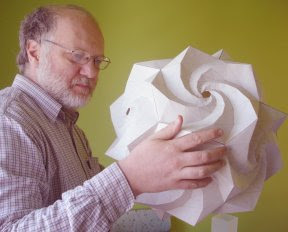 Daniel Erdély holds a complex polyhedron constructed from spidrons. Photo by Regina Márkus. He called the resulting S-shaped object a spidron. Each of its two arms looks a bit like a seahorse's tail. 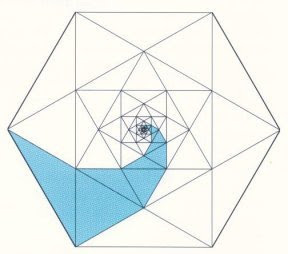 The two spiral arms of a spidron consist of alternating sequences of equilateral and isosceles triangles (above). Erdély. How to Draw a Spidron's Arm (above): Start with a regular hexagon, which has six corners. 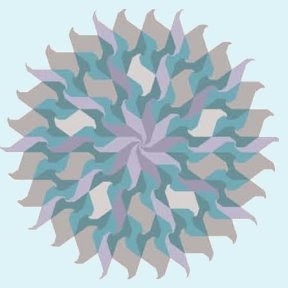 Connect every send corner with a straight line to make a six-pointed star. Inside the star is a smaller hexagon. Again connect every second corner. Continue the process until the shape in the center is so small that you can't put in any more lines. The resulting pattern contains six identical copies of a spidron arm. Erdély. Even though spidrons are irregularly shaped, they can fit together without gaps or overlaps to cover a plane (above). For example, you could tile your bathroom floor with this pattern of spidrons. Erdély, Marc Pelletier, Amina Buhler Allen, Walt van Ballegooijen. 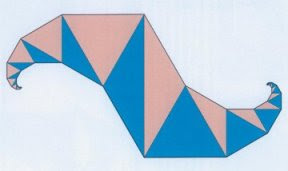 When spidrons are laid down like tiles on a flat surface, then creased in just the right way at the line within each spidron arm, the flat structure can be forced to fold accordion-style into a wavy surface (above). As the folds get steeper, the whole pattern twists and compacts. Erdély, Marc Pelletier, Amina Buhler Allen, Walt van Ballegooijen. Creased and folded spidrons can be assembled into three-dimensional balls (above). This one is made of 120 spidrons. Erdély, Marc Pelletier, Amina Buhler Allen, Walt van Ballegooijen. Are spidrons good for anything besides artwork and maybe bathroom floors? Erdély says spidron surfaces could be used for collapsible solar panels or shock absorbers. And spidron-based blocks might make an interesting toy. But mostly, he admits, they're just interesting for their own sake. You can learn more about spidrons at www.spidron.hu. Muse, February 2007, p. 26-27. Nearly everyone has 10 fingers and 10 toes, and it's been like that for a long, long time. So, it's probably natural that we count by tensso natural that the decimal system is, by far, the most common way of expressing numbers in both spoken and written language around the world. In ancient times, Pythagoras and his followers taught that "everything is number." They considered 10 to be special because it's the sum of the first four numbers, 1, 2, 3, and 4, and sets of 1, 2, 3, and 4 items can be arranged to form a triangle (like the pins in a bowling alley). To the Pythagoreans, this triangle was sacred, and they even swore oaths by it. Ten objects (billiard balls) arranged to form a triangle (above). However, 10 isn't quite so convenient when you have to measure out small amounts or take fractions of a whole. In the decimal system, it's easy to deal only with halves and tenths. But if you're slicing a pizza, halves, fourths, eighths, and sixteenths are much handier. That's what European merchants realized hundreds of years ago. Even though they used a number system based on 10 for counting and calculations, their systems of weights and measures often involved quarters, eighths, twelfths, twentieths, twenty-fourths, or sixtiethsanything but tenths. For example, there are 2 pints in a quart, 4 quarts in a gallon, 12 inches in a foot, 16 ounces in a pound, 24 hours in a day, and so on. Many people still use such measures today. The English language shows traces of this past. Notice that the numbers from 1 to 12 all have distinctive names, though "eleven" is related to "one" and "two" to "twelve." It's only at 13 that the names for numbers begin to follow a standard, ten-based pattern: thirteen = three + ten. So, just because we happen to have 10 fingers and 10 toes, we celebrate tens. If we had 12 fingers and 12 toes, we might have ended up with a number system based on 12. And for fraction fanatics, that would have been much tidier. Muse, January 2007, p. 22. Many people watch The Simpsons for its zany characters, political jokes, and outrageous situations. But other viewers keep a sharp eye out for references to mathematics. Really. Several of the show's writers studied math or computer science in college. And, from time to time, they just can't resist sneaking in a mathematical bit or two (or three). But, unless you're looking carefully, these inside jokes can be easy to miss. For example, during the final episode of the 20052006 season, which aired in May, an angry singing star tells her baseball-player husband that she will come back to him only if he can correctly guess the attendance of the day's ball game: 8128, 8191, or 8208? But these numbers aren't just any old numbers. Each one is mathematically special. The first choice, 8128, is know as a perfect number. The smallest perfect number is 6. Its divisors are 1, 2, and 3. When you add up the divisors of a perfect number, you get the number itself: 1 + 2 + 3 = 6. This doesn't happen for most numbers; perfect numbers are rare. The second smallest perfect number is 28, the third is 496, and the fourth is 8128. The second choice, 8191, is a prime number. In other words, it's evenly divisible only by itself and 1. In fact, it's a special type of prime known as a Mersenne prime. You get this number by multiplying 2 by itself 13 times, then subtracting 1. All Mersenne primes are prime-number powers of 2 minus 1. The third choice, 8208, is a special four-digit number. If you multiply each digit by itself four times, then add up the results, you get the number (8 x 8 x 8 x 8) + (2 x 2 x 2 x 2) + (0 x 0 x 0 x 0) + (8 x 8 x 8 x 8) = 8208. It's one of only three four-digit numbers that can be written as the sum of the fourth powers of their digits. The others are 1634 and 9474. Whew! You probably didn't catch any of that when you saw the show. But mathematicians Sarah J. Greenwald of Appalachian State University and Andrew Nestler of Santa Monica College have been keeping a careful watch, tracking the math in The Simpsons for years. Their Web site, simpsonsmath.com, lists math references episode-by-episode. In April 2006, the show even aired a program devoted entirely to mathwell, OK, and laughs, too. It was called "Girls Just Want to Have Sums." Now you have yet another reasonone maybe even your teachers will endorseto watch all those Simpsons reruns. For more about math in The Simpsons, see "Springfield Theory." Muse, November/December 2006, p. 44. So it's already been a pretty tough school year? Some of your grades are OK, but others are quite dismal (especially that test you took the day after staying up way too late playing Guild Wars online)? Luckily, your teacher says you can drop a single test. Alright! But wait, which one? The answer is easy if all of the tests are worth the same number of points. You simply drop the lowest score. But, if the tests are worth different numbers of points, dropping the lowest score isn't always the best strategy. Consider the following example. On the first quiz, you score 80 out of 100 points, and get an 80 percent. On the second quiz, you score 20 out of 100: 20 percent. On the third quiz, you score 1 point out of 20: a miserable 5 percent. Without the option to drop one quiz, your final grade would be 101/220, or 46 percent. Ouch. 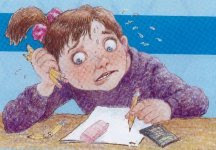 If you drop your lowest score (1 point out of 20), your final grade would be 100/200, or 50 percent. Ouch again. But, if you drop the score on the second quiz instead, your final grade would be 81/120, or 67.5 percent. Still not rocketing your way to the academic honors list, but, OK, you're passing. In this case, it pays to work out all possibilities before deciding which grade to drop. Dropping your lowest score (or your lowest percentage) wouldn't guarantee that you'll end up with the best possible result. It gets even trickier if you're allowed to drop two or more scores from your total. And if you're dealing with a lot of scores, it could take you a long time to calculate all the possibilities to find the result that helps you the most, and who wants that? Math professor Jonathan Kane of the University of Wisconsin at Whitewater and his son Daniel, a student at the Massachusetts Institute of Technology and twice a member of the U.S. Mathematical Olympiad team, to the rescue. After the problem came up in conversation during a 10K run, they worked out a fancy formula that pinpoints the scores you should drop to get the best possible result, and created a computer program that allows your teacher to do these calculations quickly and easily. AND, if you just mention casually that you're aware of their work, that will probably get you five bonus points. Muse, October 2006, p. 33. 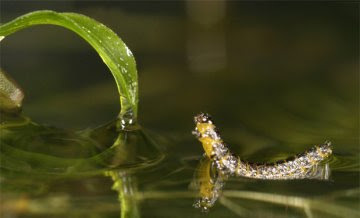 Some insects can walk on water. They take advantage of water's high surface tension to skate across a pond or puddle. But at the edge of the pond, where wet meets dry, surface tension makes the water curve upward in a meniscus. For tiny, water-walking insects, scaling this slope isn't easy. If they try to stride up the slope, they simply slide back down. So how do these insects get out of the pond? It turns out water-walking insects rely on special tricks to propel themselves upward. Surprisingly, these don't require them to move their legs back and forth in a walking motion at all, say mathematicians David Hu and John Bush of the Massachusetts Institute of Technology. The MIT mathematicians used high-speed video to capture the meniscus-climbing antics of several tiny insects. As this water treader (above) approaches a meniscus, its front and rear legs deform the water's surface to help it move up the slope. Courtesy of Hu and Bush. Some water treaders, for example, have retractable claws on their front and hind legs that allow them to pull up on the water to create tiny peaks. Each peak is itself a meniscus. And, because one meniscus is attracted to another, the slope tugs on the tiny peaks. Because the insect's front legs are closer to the slope that its rear legs, its front legs are tugged more strongly, and it is propelled forward and upward. In fact, the attraction is so strong, the insect may glide forward faster than 30 body lengths per second! 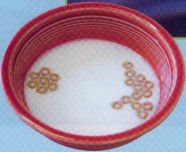 The same force is responsible for clumping breakfast cereal, such as Cheerios, in a bowl of milk (below). The meniscus created by a small floating object like a Cheerio attracts the meniscus produced by another nearby. Don't lie: you've always wanted to know why the cereal ring formed in the bowl, haven't you? Muse, September 2006, p. 28.